Obverse: Crowned and diademed facing bust of William I holding sceptre in right hand over left shoulder. Text around +PILLELM REX. Reverse: Cross pattée, with PAXS (peace) in annulets in angles. Text around +ULF ON LINCOLN. History: William invaded England and won a victory at the Battle of Hastings in 1066. He was known as William the Conqueror and was king from 1066 to 1087. He suppressed subsequent English revolts in what has become known as the Norman Conquest. There are eight types of penny attributed to William I. 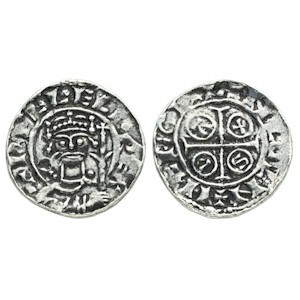 Date: PAXS type, minted in Lincoln, moneyer Ulfr, 1083-1086.